More commonly known as neck pain, cervicalgia is a condition characterized by more or less intense feelings of pain, stiffness, numbness or weakness located at the level of the neck area, in one or more of the 7 vertebrae, discs and ligaments composing it. Because it affects the part of the spine called the cervical spine, neck pain is also referred to as cervical spine pain. Neck pain is quite a common affliction, estimated to affect about 5% of the world population in a year and up to 65-70% of the world population at least once in their lifetime. It may vary in intensity from mild pain, resolving itself in a matter of days without any particular treatment, to severe, debilitating pain requiring medical attention and possibly pain-relieving medication of some sort prescribed by a health professional. As mentioned above, neck pain can be an occasional problem or a recurrent health issue that may require professional help. And sometimes, it might prove challenging to correctly diagnose it as a result of collateral symptoms that appear to indicate problems elsewhere than at the level of the neck area. 1) Neck stiffness. A stiff neck is very often a result of a bad sleeping position, lifting heavy things, bad posture or similar benign causes and should resolve itself in a matter of days, often by only alternating warm and cold compresses and enjoying a gentle massage. 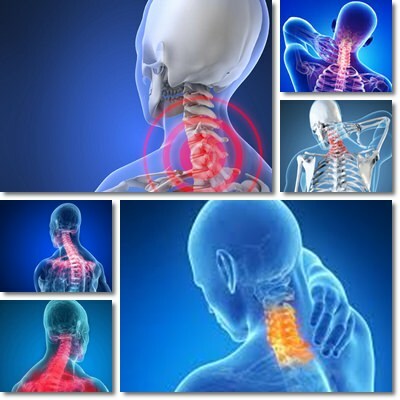 If the sensation persists no matter what you do to ease it or if the stiffness gets worse and you end up not being able to move your neck effortlessly and painlessly (back and forth and from side to side), then you might be having problems with the cervical discs at the level of the neck. In such cases, it might be best to see your doctor so he or she can correctly diagnose the cause and severity of you neck pain and provide you with adequate treatment options. 2) Shoulder pain. Very often, neck pain radiates to the shoulder and shoulder blade areas. When pain extends like this, it is usually quite intense and may encumber normal arm and shoulder movement. In some people, the pain felt at the level of the shoulder and shoulder blade is often more intense and thus may draw attention from the real source which is the neck. 3) Pain along the arm and fingers. Generally, pain originating at the level of the cervical spine vertebrae, discs or ligaments (so at neck level) may be felt in the arms and fingers as well. Arm and fingers begin to ache and feel swollen and painful. Again, normal movements may be limited, depending of course on how intense the pain is. 4) Weakness, dizziness and fainting. People suffering from cervical spine problems reveal they also feel a sensation of weakness or even a fainting sensation when standing, bending or lifting something. Indeed, neck pain may be so intense that it literally causes the sufferer to lose balance, become dizzy, light-headed and possibly faint, unless he or she can sit down or secure their position by grabbing onto something. 5) Headaches. People with recurrent or long-term neck problems can also experience headaches caused by a too intense pain in the back of the neck. Headaches can persist up to severak hours or reoccur for days, as long as the neck pain is also present. 6) Tingling and numbness sensations. Intense neck pain often manifests itself in the form or tingling or numbness sensations in the shoulders, arms, fingers or even legs. Symptoms may differ from person to person and can be very confusing, especially for someone dealing with neck pain and cervical spine problems for the first time. Seeing a doctor might be best as he or she can tell you with certainty whether or not the tingling, numbness, dizziness, loss of balance and fainting sensations you experience are caused by your neck pain. 1) Bad posture as a result of sitting in front of a computer or at a desk for too long, walking hunch-backed, sleeping on couches, chairs, etc. 2) Lack of physical activity (sedentarism) or excessive physical exercises. 3) Heavy lifting, either occasional (moving furniture) or constant (construction work). 4) Trauma and injury (fractures). 6) Muscle strains or other muscle problems. 7) Spinal disc degeneration, hernia, etc..
8) Osteoarthritis or rheumatoid arthritis. 9) Spinal cord nerve problems (sciatic nerve problems, for example). 10) Other causes: catching a cold, blood circulation problems such as acute coronary syndrome, etc. While we can all tell if we have a stiff neck because we slept bad or strained a muscle while helping a friend move his furniture, pinpointing the exact cause of our neck pain might prove overwhelming sometimes. If neck pain persists, even worse, becomes more severe, debilitating, then you should go see your doctor for a clear diagnosis. Even if your neck pain is not that bad, but doesn’t really go away, do the same. What to expect from your doctor. Your doctor will most likely ask you about things you’ve done (if you lifted something heavy, for example), what your symptoms are and when they have started, how intense your pain is, whether it got better or worse and so on. He or she may test you reflexes, try to assess pain intensity, limb movement freedom and so on and perform X-ray or MRI tests showing them what your spine looks like and helping them decide whether or not there is something wrong with it physically. 1) Avoid lifting weights, exercising too much or too intensely. This is an essential aspect to take into account by anyone suffering from any type of back problems. If your doctor says your neck pain is caused by cervical spine problems, for example, this generally means you are no longer allowed to strain your back in any way, from lifting weights to standing too much. 2) Correct your posture. This may mean you have to be careful to walk straight (not hunched), correct your posture when sitting at the computer, improve your sleeping conditions, from changing the mattress and pillows to changing your sleeping position and so on. For me, mild stretching exercises done periodically when I have to work at the computer, for long periods of time help greatly. 3) Avoid humidity and cold temperatures. Neck pain may get worse in humid environments, while cold can cause it to become more intense. This may be a mere sensitivity or rheumatism-related. Anyway, it is important for you to avoid going outside for too long when it’s raining hard or when it’s particularly humid or foggy, as well as make sure your home is warm enough for you to be comfortable. 4) Massage the affected area. No matter the cause for your neck problems, symptoms such as stiffness, pain, tingling, numbness or weakness can be greatly improved with the help of massage. From my experience, gently rubbing the affected are for at least 20 minutes can restart circulation and contribute to relaxation. And although you can pinpoint the exact source of your pain, you can also benefit from massaging adjacent areas such as shoulders, arms or lower back. 5) Warm and cold compresses. Applying warm and cold compresses can help relieve some of the pain and improve symptoms. Sitting in the warm sun is something that also helps me greatly with the pain. 6) Take your vitamins. Vitamin C is great for collagen production and muscle health, while magnesium supports muscle function. Potassium ensures the perfect conditions for electrical impulses from nerves to reach muscles, while vitamin D is essential for healthy bones vertebrae included). B vitamins also play an important role. 7) Mild physical exercise. Stretching, pilates or aerobic exercises can be of great help for anyone suffering from neck or back pain as they promote good blood circulation, relieve tension and pain and improve muscle tone and muscle control. Taking strolls through the park or riding a bike can be as useful as physical therapy, though the latter is necessary in serious cases. The key is to keep things effortless and pleasant so you don’t get muscle aches that may worsen your pain. 8) Anti-inflammatory medication. This is also an option for anyone experiencing intense pain. Nevertheless, at this point, it is also best to consult your doctor for diagnosis and a treatment plan suited to your needs and condition.